Welcome to Rusty Rex Banger Rallies. If you’re going to do a Banger Rally make it a Rusty Rex Rally. These rallies are excellent as a charity fundraiser or great just for fun. FUN! The route was Excellent. Loved the passes/routes. Some good people. Had an amazing time with everyone, will definitely return next year. Great fun with like minded people. Recommend this rally not to short not too long. Great Rally with some awesome routes and great challenges.Definitely Recommend this rally, very good. Recommend Route was Very good, Very enjoyable VERY GOOD. Rally was HOT! Would recommend air-con and rusty rex. Defiantly Recommend. Great fun if you love driving, There are some long days. Amazing, really good scenery, excellent route. Recommended. A great experience with many great memories. That includes some very stressful moments. Satisfaction is gained by pushing yourself beyond your comfort zone!!! More people should do it. Rusty Recommended. Side ways Always. Recommend? Already Have. Coming again. Recommend. Roads and organisation were excellent. Took the decision not to engage in all the challenges, just to enjoy the day a little more, relaxed lunch & stop for photo’s. Top job I’ve done the cannonball run and this was much more fun for the fraction of the cost. Great bunch of people, fun challenges, breathtaking sights, awesome night venues, just a really good crack see you next year. Had an amazing time. Challenges were Great fun. The route was one of the best we have been on, some amazing places we will never forget. I defo would recommend and have done already – its been ace. Amazing, Challenging, Exhausting but a lot of laughs. It was great really enjoyed it, Exciting. Recommended. I really enjoyed the rally, it was fantastic experience that I will try and do again. Very well organised recommended. Amazing, beautiful locations and great fun! Brilliant fun, great route, great people, fantastic sights and hellacious nights out. Cannot recommend Rusty Rex enough. 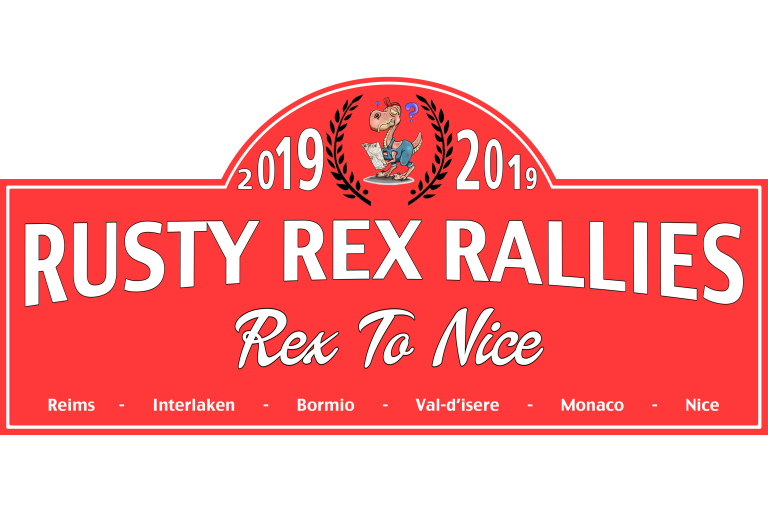 I recommend Rex to Nice. Great roads, great people. A well organised rally with a brilliant route. I regularly recommend this rally. Great time. Second time. I recommend Rusty Rex. Great! Very exciting and fun filled. The challenges are great. Challenging, Enjoyable, Exciting, Interesting, A brilliant trip- great to meeting everyone. Fantastic week. Would recommend, Great Route. FUN!! I’ve seen places I want to come back & see again. meet some great people from all back grounds. Recommend? Oh Hell Yes!! Excellent, Fun, Confusing, Love It!! Great Rally, Well Organised, Great Roads. 100% Recommended. Fantastic well worth it. The route takes in all the great driving roads providing stunning scenery everyday. Brilliant, very well organised, great routes, good challenges, decent evening meeting points. I recommend Rusty. Magic, Mr Kitchy says 6.75/10. Good Crowd. Would recommend Rusty Rex Pete does a good dance. Recommend this rally. Enjoyable but distances I think were too long have hardly eaten. Brilliant. Had a great few days and drove some of the best roads in Europe. Really good rally…good enough to do twice! I need to learn how to work the sat nav!! next year- turbo, better brakes, air-con BIG. I would recommend Rusty Rex. 100% Recommended. Great rally good routes nice places. First rally I’ve done looking forward to next time. A friend Recommended me, would I recommend? YES!!!! Big challenge, but very exciting. Lots of Laughs. Great crack! scenery and roads fantastic. The challenges make for a good laugh..loved it!